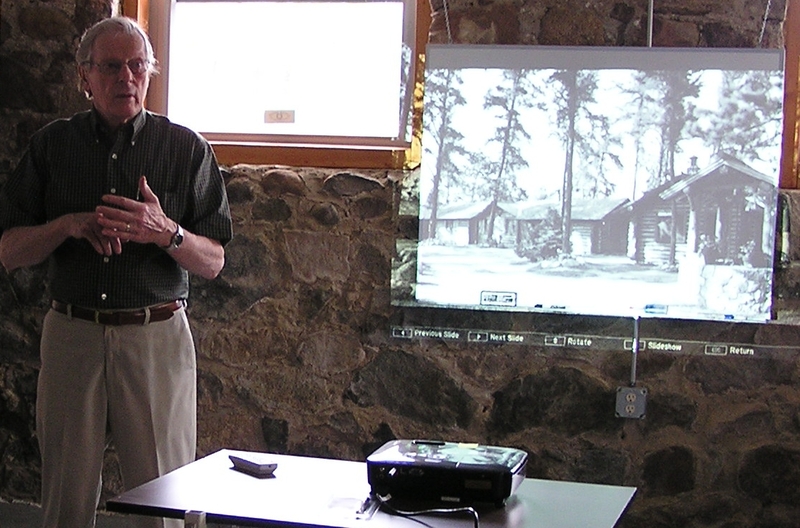 On a hot July 18, in the basement of the cool Hubbard County Historical SocietyMuseum, I showed a few slides of unidentified local resorts as part of the museum’s noontime Brown Bag Lunch Series. We met in the recently refurbished room dedicated to early resort history and tourism. After receiving some clues, those attending wrote down their guess for the resort’s early name. Connie Henderson, the Director, collected the guesses and drew for prizes, which were two of my books. Sheldon Schiebe, from Knotty Pines Resort on Boulder Lake, won The Early Resorts of Minnesota, and Dennis Thompson won The Edge of Itasca.